Don't let negativity distract you from your light. Shining our light is not about overshadowing others. It's about sharing our story and speaking our truth with the intention to connect as well as about transforming the way we give, love and live. Shining our light is also not about feeling 100% complete. It's about stepping beyond our fear of not being complete enough and accepting the broken pieces within as sources of light and learning. When we let negativity distract us from our light, we forget that it is our right to find happiness. That it is rewarding to share the wisdom that we have learned on our journey to self-discovery. By acknowledging our own light, we also give others the chance to acknowledge their own light. Do not cling to any concept, belief or idea about how we think shining our light should or shouldn't be. Instead, focus more on the path to self-growth and self-love. Focus more on embracing every aspect of our being, regardless of where we are on our path. Focus more on not allowing those moments of darkness to overshadow our spirit. Encourage ourselves to remember times when we made the world a more positive place, and know that the moment we share our light, the world does become a brighter place. we forget that it is our right to find happiness. Happy Full Moon! The Moon in Leo is forming an opposition to Mercury and the Sun in Aquarius, marking an extra encouraging and emboldening Full Moon in the sign of the Lion. This particular Full Moon also happens to be a Lunar Eclipse, and as it is happening in the sign that's all to do with the heart, there is a gateway opening toward a brand new sense of emotional freedom. Realizing that we are more in charge of our own thoughts and feelings than we give ourselves credit for is one of those important steps to liberating ourselves from the pressures of modern day stress. Know that taking charge of our own emotions is not about guarding ourselves from unwanted emotions. It's about honoring the fact that we are humans with feelings and that those dark moments are only temporary. When we stop allowing our emotions to dictate how we live our lives, we can become more aware of them without feeling powerless in the process. 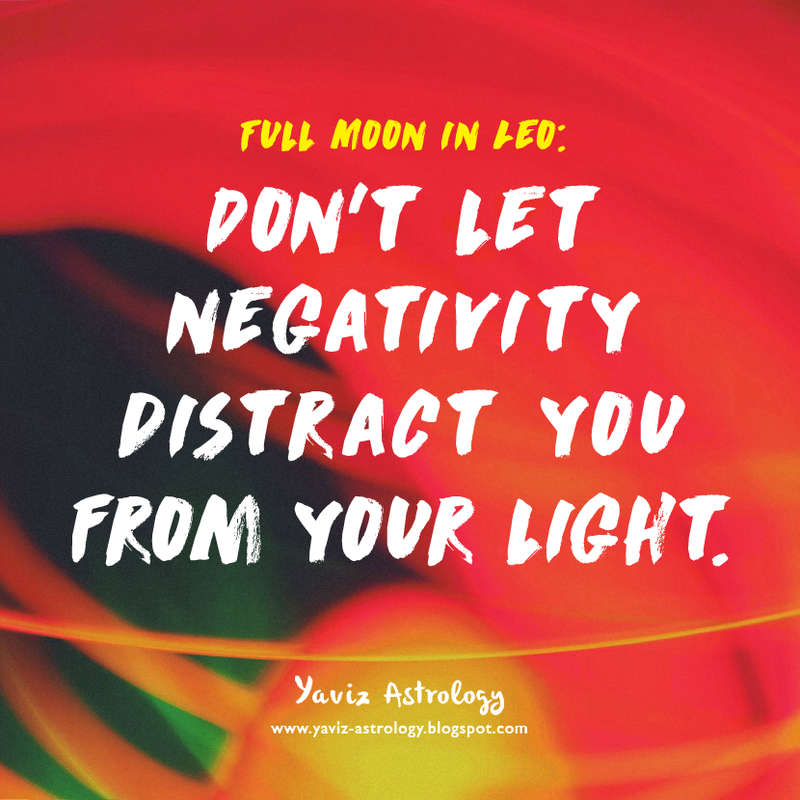 The Moon is forming a trine to Venus and Mars, and the magick is in focusing on what we are attracting, rather than pushing away what we don't want. In other words, stay positive, because with Mars and Venus conjoining in the sign of go-getting Aries, whatever we focus on can accelerate. If we have been wanting to do something, now is the time. Don't hold back anything, because anything is possible when we take charge of our day and put our heart and mind to it. As the Leo star Madonna once said, "A lot of people are afraid to ask for what they want. That's why they don't get what they want." from the pressures of modern day stress. The Full Moon is also forming a trine to Uranus and Saturn, and we realize that our work, our relationships and our very being are directly correlated to our values, ethics and core beliefs. Are they still true for us? Will they stand the test of time and serve as the solid foundation in which we construct our lives? Perhaps our values have changed and it is time to let go of things that no longer serve the vision we have for our lives. Saturn is reminding us that now is the time to build on the strong foundation we have already laid for our prosperity, and Uranus is asking us to keep in mind that these foundations are permeated with the sparkling energy of our creativity. With the Moon's sextile to Jupiter Rx, accepting the truth that everyone has flaws is a sign of spiritual growth. We are being asked to be aware of the dynamics we no longer want to repeat, and to stop trying to be all things to all people. The Full Moon in Leo is reminding us to choose our role and be true to it. There is no greater feeling than to express ourselves from a place of authenticity. This is not the time to dim our light in order to play a role within the larger whole. This is the time to be real, to be ourselves and to stand tall in our own unique light.